Much of the country was socked in on Christmas by a snowstorm that dropped lots of snow and temperatures well below freezing. While it was inconvenient for many families to have to postpone their family celebrations to another day, it was downright hard work for farm families taking care of livestock. We had two family Christmas gatherings planned and they were both postponed. We do have 4-wheel drive pickups and plenty of horsepower that we could have made the drive to Grandma's house, but with the extra chores and extra time it took taking care of the cattle, we had no time left for opening presents! Kansas is notorious for cold winters--not as cold as North Dakota and other more arctic states, but we have the best (or worst) of all seasons. We have extremes like 115 degrees in the summer--usually during the county fair--and -20 degrees in the winter. But recently, we haven't had much snow. I remember in my childhood, having a full week out of school due to winter weather and we used to get lots of sledding time behind a horse being pulled through the hay field on a saucer sled. As an adult, we just haven't had much snow during the winter in central Kansas. Well, finally it hit us too! The snow that fell measured only about 6 inches deep, but the winds blew it around so much that there were places that the ground was bare, and other places with drifts 6 FEET deep! 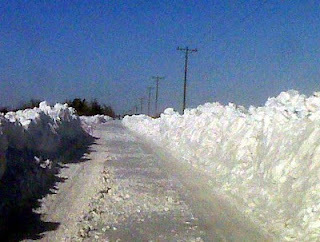 The picture at left shows a county road that the road grader barely made it through and has had to grade it again and again, as it keeps drifting shut. The snow piles are now taller than my pickup windows! Today is the first day that the temperatures have made it above freezing since before the Christmas Eve snowstorm and the piles are beginning to melt. 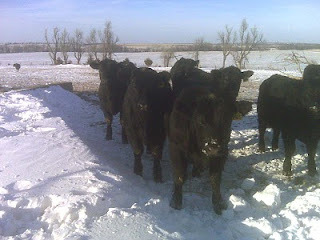 But last weekend, my family and I had to work cattle and vaccinate before calving. We planned a full weekend of gathering cows, sorting them into groups based on their projected date they will calve, and vaccinating them. So I was up early in the mornings, filling crockpots with soups for lunch and lasagne or french dip beef roast for hearty suppers. We bundled up in layers and headed out to do the work. 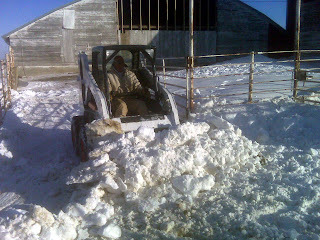 As the kids and I began sorting the cattle into their calving groups, my husband once again, used the skid loader to clear snow out of the working pens so we could open and close the gates! Once the snow was cleared and we had the cows sorted up, we were able to give them their needed vaccinations and get them to their new pens or pastures in preparation for calving. I doubt that we will have much of this snow melted by the time we have our first calf born, but we have done all that we can to be ready! Of course, after the long day of working cattle, the kids did some goofing around on the snow piles...and so did the young bulls! They all enjoy rolling around in it and I wish I had gotten a good picture of the one young bull who thought he should rub his entire head and shoulders in snow! He was white to the shoulders and proud of it! Now that we finally had a chance to get together with our families for Christmas, and the weather has finally warmed up enough to enjoy being outside again, we are prepared for calving season. It should be a couple of weeks before the first calf arrives, but with the stress of the cold weather, extra care and feed are needed to have healthy strong calves. If you are not willing to work hard in really difficult conditions, do not consider cattle ranching! The cows need cared for on a schedule--and not just when the weather is nice! So we bundle up, wear lots of layers and warm boots, and head outside to take care of the livestock who depend on us. This is not the fun part of my job, but it is one of the most important parts! I look forward to posting pictures of our first calves in a few weeks! Those little wobbly babies snuggling up to their wooly mama cows makes all the work worthwhile! Well this is huge! It must have been really difficult for you people to take care of your livestock in such intense weather. Looks pretty in pictures by the way lol.